Maid in America vintage postcard now has chicken salt and pepper shakers to keep her company..
Not real chickens, although I grew up taking care of the little ones when they first came in. I would love to have chickens again but my limestone hillside garden is steep and not the best terrain for chickens. Enter my new interest in salt and pepper shakers for kitchen decor, thank goodness its not another vintage cookbook because I have to remove one before I can add another one. I like to change the salt and pepper shakers with the season, coupling them with my vintage framed postcards on the tray where I keep my pens, papers and fresh flowers. The tray and it's sundry items is the first thing I see when I go into my kitchen. Can you tell which one is the hen and which one rooster? 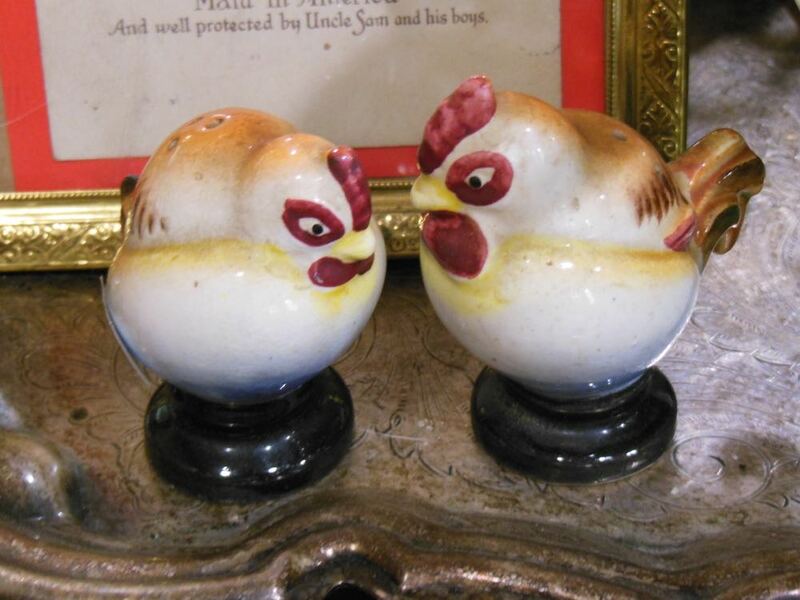 I found these chicken salt and pepper shakers in St. Louis at a little antique store. The owner said people aren't collecting salt and pepper shakers any more so I should be able to find some nice little sets. See their different tail feathers? Back of the chicken salt and pepper shakers show which one is the hen, which one rooster. Here's to a "cockle-doodle-doo" of a Fourth of July!